If 1993 Bowman gets a lot of attention because of Derek Jeter, 1994 Bowman Baseball is the set that doesn't have the Hall of Fame pedigree but deserves respect nonetheless. It's just like Jeter's Core Four teammate who makes his cardboard debut in the set, Jorge Posada. With 682 cards, the set is big. 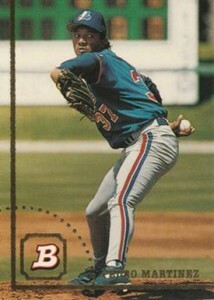 At this point, Bowman was fully embracing its identity as a place for rookie cards. This is particularly true for draft picks and other prospects that appeared in few, if any, other sets from Topps or other manufacturers. Posada remains the top first-year player in the set. 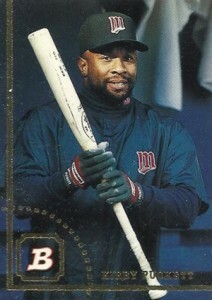 Other notable rookie cards include Torii Hunter, Jermaine Dye, Derrek Lee and Edgardo Alfonzo. 1994 Bowman Baseball has no inserts but there more than 50 foil cards in the middle of the set. These use etched foil to highlight key prospects, minor league MVPs and a subset called "Diamonds in the Rough." Foil cards are inserted one per pack. The set's design is a simple one. Images use a full-bleed format. Gold foil is used to to house the nameplate ad Bowman logo. It's done in a way that the foil resembles a baseball field. Backs have a second photo. 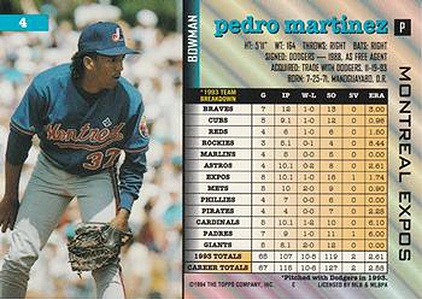 Rather than taking a traditional approach to stats, at least compared to most sets, 1994 Bowman Baseball continues with the brand's habit of breaking down a player's performance against other teams. 1994 Bowman Baseball is an average offering for the brand compared to other sets from the decade. At one time, the checklist felt much stronger when the likes of Dye and Lee were consistently among the league leaders and playing in All-Star Games. But even then, Posada didn't have the same collector appreciation that he does today. Also contributing to this set's popularity, or lack of, is the fact that 1994 saw Topps introduce Bowman's Best and its chromium look. 682 cards. Shop for sets on eBay. 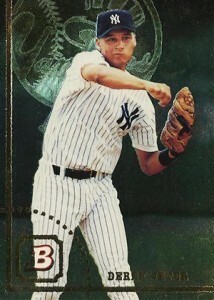 Derek Jeter 1994 Bowman Foil Card #376. PSA 9.